The new owners of Dolphin Key Resort in Cape Coral, FL, hired the Agency for marketing expertise as they were bringing the historic hotel back to life. The resort was undergoing a major remodeling beginning in 2012 that resulted in a retro hotel atmosphere mixed with resort-style amenities. The upgrade was the largest reconstruction project in downtown Cape Coral at the time, and would turn a blighted Del Prado Inn into a casual, comfortable and affordable Florida-style resort that has gone on to be a success. Dolphin Key offers guests 100 spacious rooms, a Tiki Hut Bar & Grill — the largest in the United States — a restaurant that was undergoing renovations, swimming pool, courtyard and entertainment. 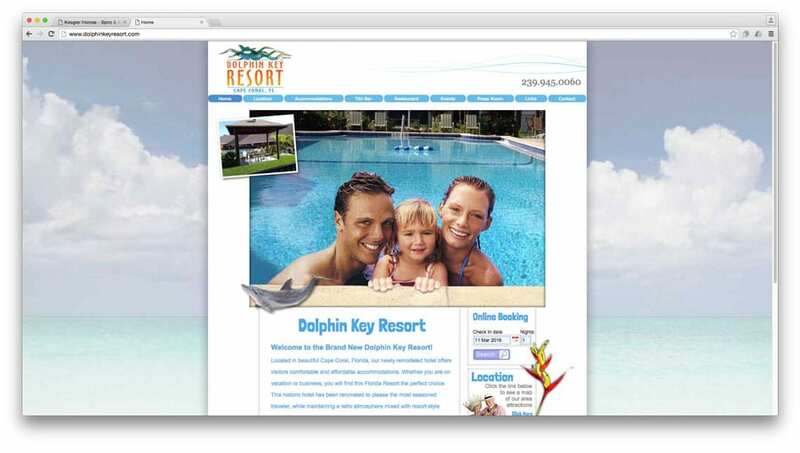 The Brand Architects® at Spiro designed and developed the resort’s website and brochure, both of which were still in use as of 2016.